The 8th Tennessee Equality Project Gumbo Contest presented by Hilton Memphis will be held on Sunday, January 21, 2018. TEP's annual Mardi Gras celebration brings together teams from the Western, Middle and Eastern United States to compete for the best gumbo in Memphis. Gumbo contestants will be awarded prizes by an appointed panel of judges and by individual tasters like you in the People’s Choice competition. TEP is grateful for the generous support of its presenting sponsor for 2018: Hilton Memphis! 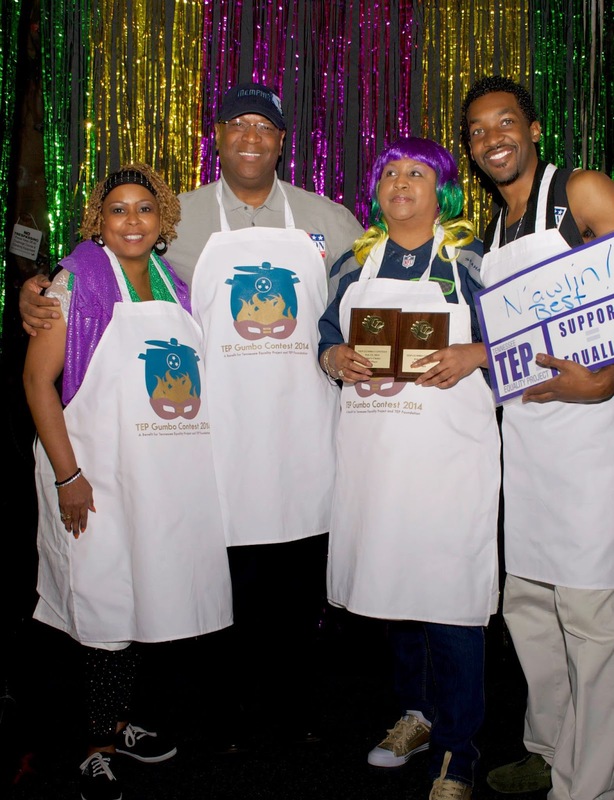 TEP's annual Mardi Gras gumbo competition draws large crowds who support the LGBTQ community of the Mid-South and draws many public and elected officials. Review the sponsor information below and select the right level for you on the left. If you prefer to write a check for your sponsorship, mail a check to "TEP Foundation", c/o Jonathan Cole, 1889 Nelson Avenue, Memphis, TN 38114. If you choose a Flaming or Hot sponsorship, you will be assigned a VIP Table closest to the dance floor in the event space in the order that sponsorship are completed. Sponsors will receive tickets by mail to the purchaser within a few weeks of the event. Hilton Memphis is the Presenting Sponsor for the 2018 TEP Gumbo Contest. VIP Table (8 seats) with complimentary King Cake (while supplies last). After making your sponsorship donation, you will be prompted to choose a VIP table nearest the stage and dance floor. 8 gumbo tasting tickets for the People’s Choice competition which includes live music and 8 beer/soft drink pass wristbands. Promotional advertisement of your business on the event web page. 4 gumbo tasting tickets for the People’s Choice competition which includes live music and 4 beer/soft drink pass wristbands. 2 gumbo tasting tickets for the People’s Choice competition which includes live music and 4 beer/soft drink pass wristbands. Click the "Continue" button on the left to contribute your desired sponsorship level based on the above table. In-kind gifts of decorations, beer, or other supplies used in the event may be donated. In-kind sponsors will receive 2-8 gumbo tasting tickets (which includes live music and one beer or soft drink ticket per admission) and promotion of your business in the event program. In-kind gifts of $500 or greater will receive a VIP Table with 8 seats. In-kind gifts are tax-deductible to the fullest extent allowed by law. For more information or to volunteer for this event, contact Jonathan Cole at jonathan@tnequalityproject.com / 901-301-3306. Why should your business or organization sponsor the TEP Gumbo Contest? Tennessee Equality Project Foundation, a 501(c)(3) organization, provides educational projects and programs which advance the well-being of LGBTQ people and their families here at home in Tennessee. Unlike other organizations that advance equality, every dollar contributed to TEP Foundation is spent here in Tennessee. A diverse group of over 500 LGBTQ people and their allies attend the TEP Gumbo Contest each year. Attendees receive a program with sponsor ads and information and will see the event sponsor reel on the projection screen during the event. Our PRESENTING sponsor and FLAMING sponsors will be thanked from the main stage during event announcements. Tennessee HB1840, the Counseling Discrimination bill, highlights the need for counselors, therapists, psychologists, psychiatrists, and social workers to speak out for inclusive practices. We urge any practitioner to endorse the statement below. Those who endorse will be listed on our website and receive a Tennessee Open For Business window cling for display in their offices. If you would like to support programs like this, make your tax deductible contribution at this link. As counselors, therapists, psychologists, psychiatrists, and social workers serving clients in Tennessee, we affirm that we do not discriminate based on sexual orientation or gender identity and we will not use our own sincerely held principles as a reason to turn clients away.